Holdsworths first club was Australian team St.George Illawara, who he joined in 2004. In 2006, Holdsworth joined the Canterbury Bulldogs. He spent three years at the club, making 66 appearances, scoring 13 tries. During his time at Canterbury, Holdsworth made a reputation of his goal kicking abilities by winning goal kicking competition of Rugby League in 2008. In 2010, he signed for Salford, and was an instant hit securing a three year contract. 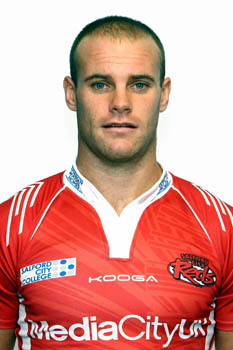 He has been Salford’s top goal and point’s scorer in 2010 and 2011. Whilst at Salford, Holdsworth has also collected Player of the Year, Player’s Player of the Year and Supporters Player of the year.